Prida Guida & Company Add Legend Frank Perez Jr. To the Team | Prida Guida & Perez, P.A. TAMPA, FL (October 5, 2017) – At 16 years-old, Frank Perez Jr. was already working inventory orders for the local grocery store Big Barn. His passion for numbers helped him quickly advance through the ranks, and they told him he had a future there if school didn’t work out. Perez graduated from Jefferson High School in Tampa, Florida in 1951. He earned an accounting degree in 1955 from the University of Florida and passed the CPA boards in 1961. He has been a practicing CPA ever since, focusing on tax preparation and reviews for personal and business clients. Before passing his CPA boards, Perez worked for the local accounting firm David M. Schwartz, CPA. It was there he earned his nickname “The Kid” from a man named Lou Prida Sr.
Perez spent years working for some of the most respected accounting firms in Tampa. After 15 years working with Borges, Hearne, Ryals & Perez CPAS, he decided it was time to open his own practice. 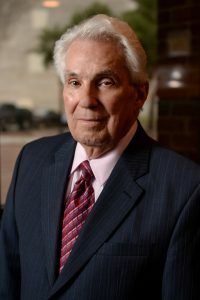 In 1976, after his son passed his CPA boards, he expanded the practice and changed the name to Perez & Company, PA.
After 56 years of running his own practice, Perez will be joining the Prida Guida & Company, PA.
“How my dad spoke of him and his clients, it’s a natural fit,” says Lou Prida Jr.
About Prida, Guida & Company, P.A.